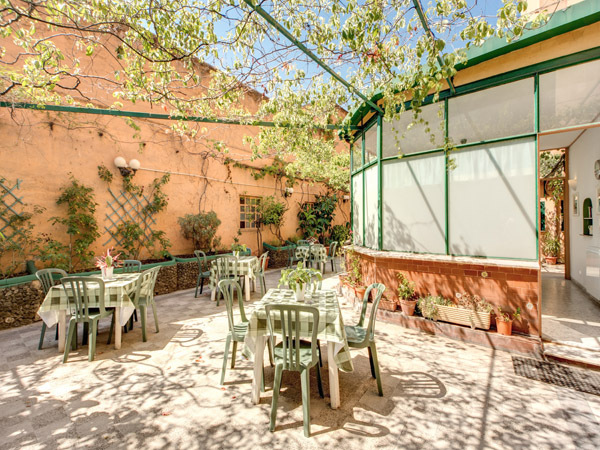 The budget Hotel Carmel enjoys a great location in the heart of the charming medieval area of Trastevere, on the west side of the River Tiber in Rome. A wander through the narrow side streets and unspoilt architecture around Trastevere is the perfect way to explore an authentic part of the city. Its vibrant and varied street life shows a real mixture of the old and the new, and the visitor can enjoy a real sense of modern Roman life. Handily placed for John Cabot University, the hotel location also permits easy access into the centre of Rome with its countless attractions, museums and historic wonders. And just minutes away across the river Tiber is the city’s Jewish area, with its wonderful Great Synagogue, kosher restaurants and shops. From Termini Station, take bus 75 to Morosini E./Nuovo Regina Margherita Hospital. Via Goffredo Mameli is to the left of the hospital, and you will finds us at number 11. Alternatively taxis can be hired at Termini. From Ciampino airport, which is slightly closer to Rome, take the SIT bus Shuttle to Via Marsala, Termini Station and follow the directions above. From Fiumicino, take the train to Rome Trastevere station. Trains leave the airport on regular basis from 6.30 a.m. until 11p.m. Tickets are available for sale in the airport and cost around €5. If you plan to arrive by car, please be aware the Hotel Carmel has no reserved parking places.